The Folding Dining Table Set includes a foldable table and 4 Comfortable folding chairs. The sides of the table fold down and the four folding chairs easily stow underneath for storage when the table is not in use. Two of the Folding Dining tables legs have wheels which allows it to be easily moved out of the way and stored. The storage feature allows the chairs to be out of the way and safe from damage. 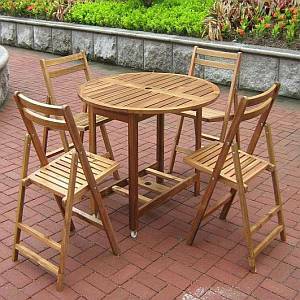 The Folding Dining Table Set is constructed of Acacia Hardwood with an oil-based stain. It also features an umbrella hole which allows for a standard size umbrella to be added for shade. Minimal assembly is required. The hardware and easy to follow assembly instructions are included.